Our Friday BLACKFISH trip saw great improvement over the trip a week before. We caught plenty of shorts on almost every spot with some keepers up to 6lbs. mixed in. Some guys had 2 or 3 keepers plus a dozen shorts. Not great fishing but good enough to keep everyone interested. 2 LIMITED LOAD BLACKFISH MARATHONS from 6:00 AM-5:00PM on Friday morning April 19 and 26. The fare is $100 and these trips must be booked online to guaranty we are not overcrowded. 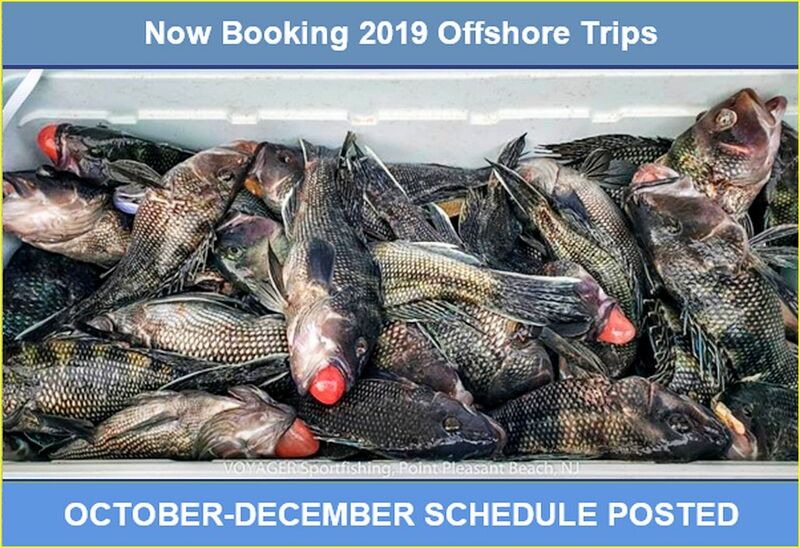 This week's TILEFISH trip was canceled due to bad weather. We still have spots available on the next 4 Friday nights. Cod and Ling mid range trips. The mid range COD trip was slow with just a handful of keeper COD and a couple of LING. Hopefully things change around soon as the water warms up a bit. We will also be adding some LOCAL and OFFSHORE COD trips as our schedule allows. Check our TRIP CALENDAR frequently for updates. Happy to see another 2-day trip in there!